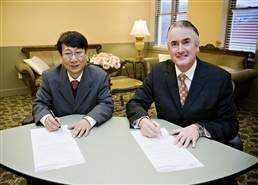 BELLINGHAM, WA--(Marketwire - Feb 1, 2012) - Integral Technologies, Inc. (OTCBB: ITKG) (OTCQB: ITKG), an emerging leader in hybrid conductive plastics, announced today the signing of a Letter of Intent ("LOI") with Hanwha L&C of Korea that contemplates granting Hanwha L&C certain rights to manufacture and distribute Integral's signature ElectriPlast™ technology in various parts of Asia. Integral is the original researcher, developer and 100% owner of all intellectual property surrounding the ElectriPlast™ technology, and markets the ElectriPlast™ product through Integral's wholly owned subsidiary, ElectriPlast™ Corp.
Hanwha L&C's desire to enter into an LOI followed the results of independent testing of ElectriPlast™ that took place over the past few months. Testing for conductivity, shielding (both electric and electro-magnetic) and mechanical strength all met or exceeded Hanwha L&C's demanding requirements. The LOI with Hanwha L&C represents Integral's potential expansion into Asia. "We are excited to possibly have a strategic partner like Hanwha L&C manufacture and distribute ElectriPlast™ in the large regional manufacturing Asian base," said William Robinson, Integral's Chairman & CEO. "We appreciate that Hanwha L&C understands the uniqueness of the revolutionary technology behind our conductive pellet, and we recognize the value to Integral to potentially have such a respected strategic partner like Hanwha L&C with its multitude of Asian marketing channels." Specifically, the LOI contemplates Integral and Hanwha L&C entering into definitive agreements granting an exclusive license to manufacture and distribute ElectriPlast™ in Korea. The LOI further contemplates a non-exclusive license to distribute ElectriPlast™ in China, Japan and Taiwan, as well as a right of first refusal to extend the exclusive license to manufacture in Korea to China, Japan and Taiwan and to make the non-exclusive license to distribute in China, Japan and Taiwan an exclusive license. Hanwha L&C is part of the Hanwha Group, a global diversified company with nearly $30 billion in annual revenue that operates in three main sectors: manufacturing & construction, finance and services & leisure. "We see the conductive plastics market as a tremendous growth opportunity and the ElectriPlast™ technology as a leader in this young industry," said Won S. Choe, Hanwha L&C's Vice President of Business Development. "Integral is a strategic fit for us since we are already a force in the thermoplastics industry and have many potential uses for ElectriPlast™ in our different lines of business, including our automotive division. We are also confident that this potential partnership will make ElectriPlast™ a product in great demand with our customers throughout the Asian region." The LOI is non-binding and calls for the completion of certain milestones by the parties. They look forward to potentially executing definitive agreements in the first half of 2012. Integral Technologies, Inc. (OTCBB: ITKG) ("Integral"), (http://www.electriplast.com/) engages in the discovery, development, and commercialization of electrically conductive hybrid plastics used primarily as raw materials in the production of industrial, commercial and consumer products and services worldwide. Its core material, ElectriPlast™, is a non-corrosive, electrically conductive resin-based material whose properties allow it to be molded into any of the infinite shapes and sizes associated with plastics, rubbers and other polymers while reducing component weight by 40 to 60%. Integral is a leader in conductive hybrid plastics with a broad Intellectual Property portfolio referencing its ElectriPlast™ technology. Applications for ElectriPlast include: Shielding Wire, Power Electronics, Connectors, and Cables; Shielding, Conduction, Batteries, Semiconductors, Heated Elements, Sensors, Antennas, Medical Devices, Consumer Electronics and Acoustics, Fuses, Capacitors, Resistors, RFID, Busbars and Terminals. Follow us on Facebook and Twitter. Founded in 1965, Hanwha L&C has been a representative Korean company in the construction materials field for half a century. With respect to accumulating original high value technical skill and retaining top employees, Hanwha L&C has been expanding the business to future growth industries such as auto lightweight materials, electronic materials, and photovoltaic materials, as well as focusing on high value pioneering industries. Hanwha L&C supplies global automakers with a variety of interior and exterior auto components made with lightweight materials such as glass fiber mat-reinforced thermoplastic (GMT), lightweight reinforced thermoplastic (LWRT), and expandable polypropylene (EPP). Including its acquisition of US-based LWRT maker Azdel, Hanwha L&C has strengthened its position as a global auto materials supplier with establishing production bases in the United States, China, and Czech Republic. Hanwha L&C has also produced EVA sheet for photovoltaic module encapsulation and is now investing to expand production capacity. In the construction materials field, the company operates plants in Korea and North America to produce construction materials as well as HanStone® Quartz surfaces for global markets. This press release contains "forward-looking statements'' within the meaning of Section 27A of the 1933 Securities Act and Section 21E of the 1934 Securities Exchange Act. These statements include, without limitation, predictions and guidance relating to the company's future financial performance and the research, development and commercialization of its technologies. In some cases, you can identify forward-looking statements by terminology such as, "may," "should," "expects," "plans," "anticipates," "believes," "estimates," "predicts," "potential," "continue," or the negative of these terms or other comparable terminology. These forward-looking statements are based on management's current expectations, but they involve a number of risks and uncertainties. Actual results and the timing of events could differ materially from those anticipated in the forward-looking statements, as the result of such factors, risks and uncertainties as (1) competition in the markets for the products and services sold by the company, (2) the ability of the company to execute its plans, (3) other factors detailed in the company's public filings with the SEC, including, without limitation, those described in the Company's annual report on Form 10-K for the year ended June 30, 2011 as filed with the Securities and Exchange Commission and available at www.sec.gov, and (4) the parties may be unable to agree upon definitive agreements. You are urged to consider these factors carefully in evaluating the forward-looking statements. About this company Integral Technologies, Inc.